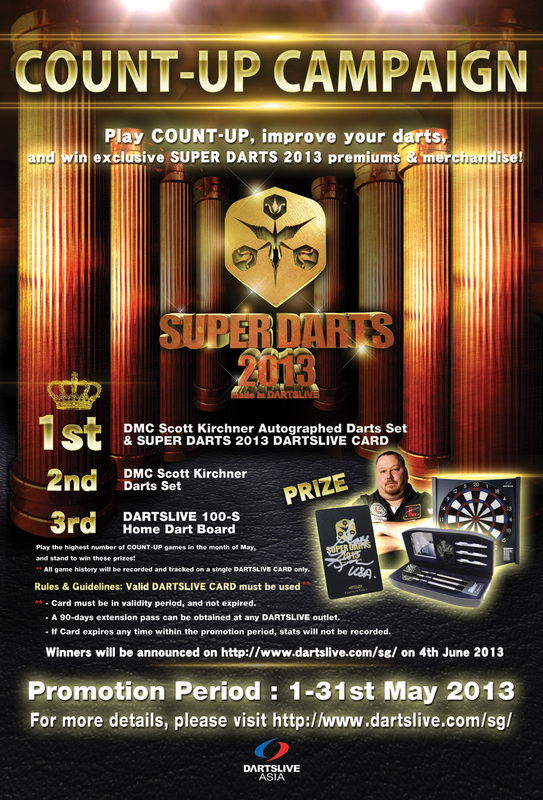 For the past one month, many players COUNT-UP skills have increased and player who played the most COUNT-UP can stand a chance to win SUPER DARTS 2013 Champion, Scott Kirchner's autographed dart set as well as an autographed SUPER DARTS 2013 DARTSLIVE CARD! 1st cRaZ_03 BOSS BAR DMC Scott Kirchner' s autographed Dart set and an autographed SUPER DARTS 2013 DARTSLIVE CARD. Congratulations to the awardees and at the same time to every player who have participated in the event, thank you for joining us! To every Darts player, please continue to practice hard. In order to become world-class professional, one will have to surpass themselves before surpassing the others. Practice more COUNT-UP to train yourself! **Starting from June 11 to 25, prizes will be distributed to all winners at their registered Home Shop.